WEATHER: misty and heavy cloud to start with, this burnt off later giving broken sunshine. Still cold. It can’t always be perfect with lovely weather and wall to wall birds, so we expected a day or so with cloud or rain and fewer birds and that is exactly what we got today. At the Finca it was a cloudless, chilly morning, but after breakfast we drove down into the valley towards Zorita and met thick mist with cold, overcast conditions. Our first couple of hours of birding was confined to scanning fields in the hope of finding a Stone Curlew or some Sandgrouse. What we did find was hundreds and hundreds of noisy larks, lots of Marsh Harriers, Black Kites, Common Buzzards and the odd Griffon Vulture. We also had close encounters with a Roller and several Gull Billed Terns quartered the fields looking for breakfast. But apart from the usual crowd of White Storks, Lesser and Common Kestrels and the odd Iberian Shrike or two we saw nothing else new for us. 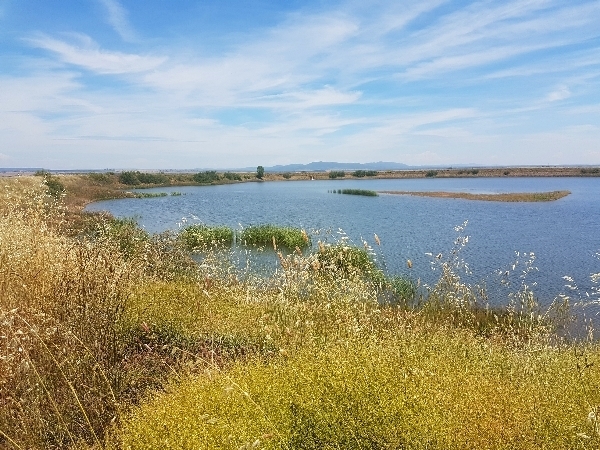 Our next stop was the at the dam called Sierra Brava, it held back a huge body of water which produced our first sightings of Great Crested Grebe and on the ‘dry’ side of the dam we had a terrific vista of the surrounding countryside with the rice fields in the distance. Immediately below us was a reed-fringed pool where we found a couple of Purple Herons, Great Reed Warbler, lots of Jackdaws and Pigeons. We could hear Common Quail and Cetti’s Warbler but we never saw them. At the rice fields near Madrigalejo we found a small flock of Red Avadavats, these tiny finches are escapees and now breed in Spain, they are a beautiful little bird. Many Iberian Magpies were feeding on the rice fields which were just being flooded and after seed planting. 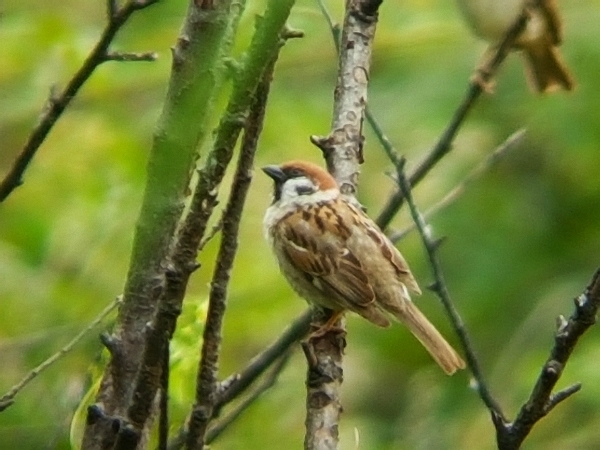 Our first planned walk alongside the rice filed s and a eucalyptus woodland produced dozens of sparrows, Tree, House and Spanish were all there. 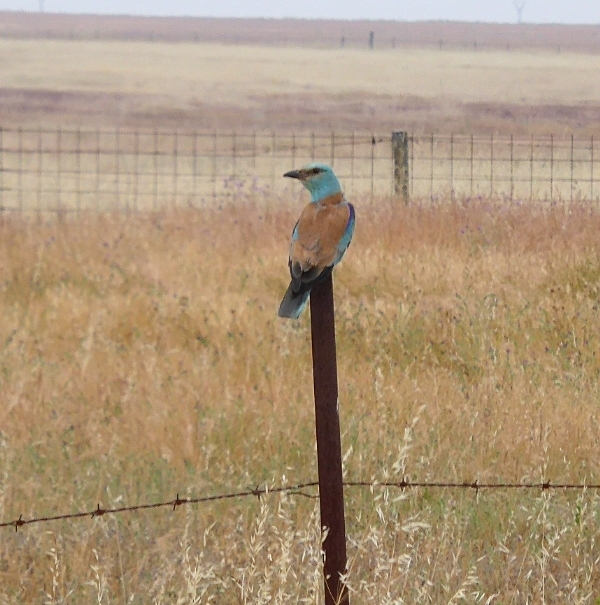 We also had good views of Bee-eaters, a male Golden Oriole, lots of Spotless Starlings and a Melodious Warbler. At a bridge over the Rio Pizzaroso we had three short encounters with a Common Kingfisher and we had glimpses of Common Nightingale. Driving further into the rice fields we found our first Lapwing and our first Turtle Dove which was perched, all the other sightings of this species had been of it in flight. 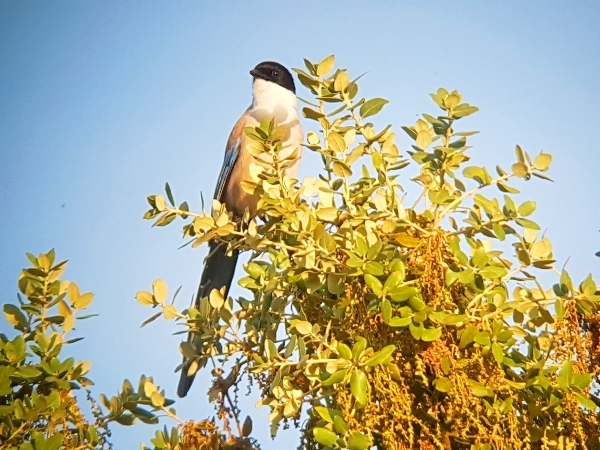 For the next hour we drove to another area of rice fields near Madrigalejo but they seemed quite desolate, we saw a few Iberian Shrikes, Common Stonechats and in one field a family party of Hoopoes were feeding. We ate our lunch by the side of the track that led into the rice fields. Two more bodies of water and another area of rice-fields took up the rest of the afternoon. A quick stop on another bridge over a reed covered stream produced nothing new but we did close views of White Stork chicks on the nest and more Bee-eaters. La Moheda is a reserve near the town of Obando and it an area of Dehesa set aside for wintering Common Cranes, a huge reservoir was also built for roosting birds. My last visit in April produced many sightings at the lake so we took a look today. A pair of Little Ringed Plovers mobbed us on the approached track, we were obviously near their nest so we moved on quickly. Unfortunately, the lake was being ‘topped’up and the water depth was already too deep for waders. A large flock of Mallard, with four Egyptian Geese, four Black-winged Stilts and a single Little Tern was all we saw. 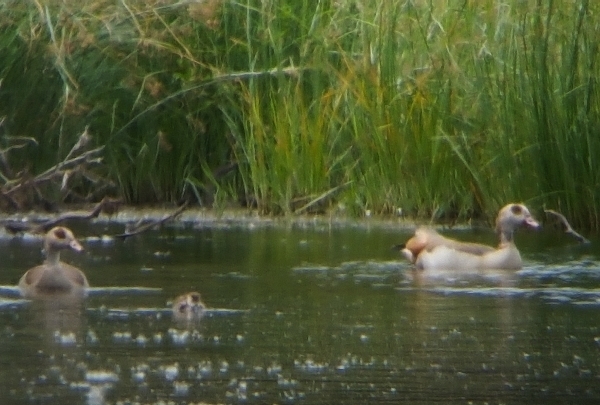 What a disappointment, we decided to walk round the perimeter of the lake because from our high position we had great views of the surrounding fields and we hoped for a sighting of Collared Pratincole. A huge bird flew up from the grassy bank of the reservoir, immediately we though Buzzard, but it was too dark and as it landed a couple of hundred meters away we saw that it was an Owl. What owl is that big? Could it have been an EAGLE OWL, well yes!! 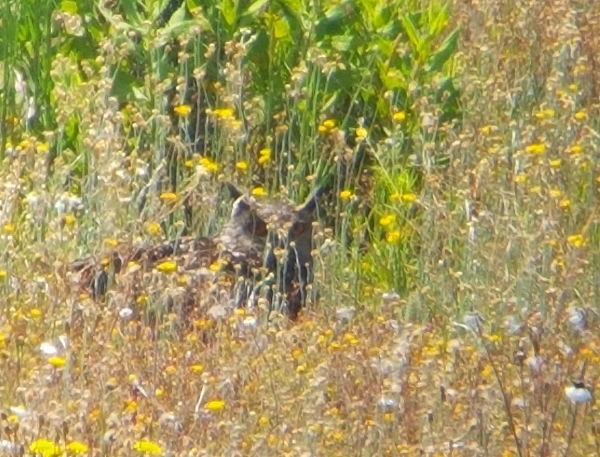 Eagle Owl on a grass bank next to a reservoir? how odd! We walked further round the perimeter of the water and relocated the owl and sure enough it was an EAGLE OWL. It flew a second time and landed on the only remaining island in the reservoir, where we had great scope views of it before it disappeared into a small shrub. How extraordinary, what was a an Eagle Owl doing there? 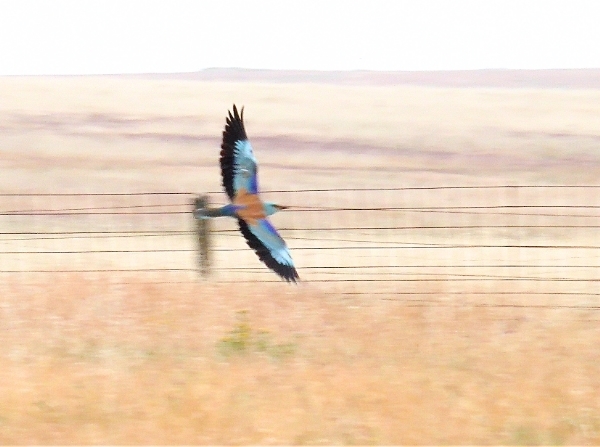 That sighting perked up the group as we drove away from the area back toward Trujillo. We made a slight detour to vist more rice fields near Vegas Altas but still we couldn’t find a Pratincole. Our final destination was yet another reservoir near the town of Alcorrin, it was quite windy there but we saw some good birds. Our first produced Little Egrets, Mallards, Egyptian Geese, Gull-billed and Little Terns and a couple of dozen Great Cormorants. Next we drove to a picnic site near a small secondary dam, this was the nature reserve section and it held some good birds. Luckily for a Marsh Harrier flew low over an island just as we arrived, it flushed out a flock of Eurasian Spoonbills with some Egrets. 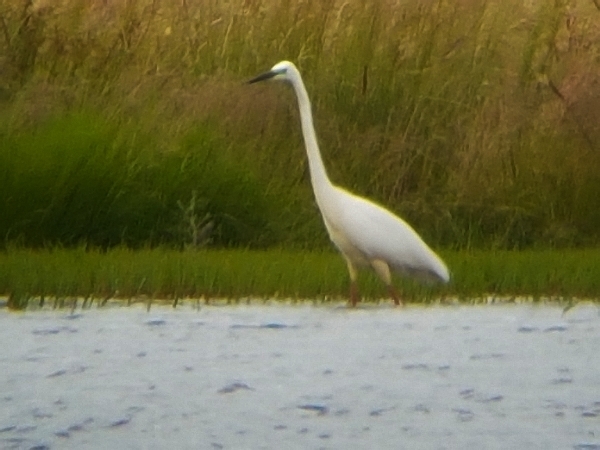 Five Great White Egrets fed along one shoreline and a family party of Egyptian Geese milled around the dam. We also had good views of Common Kingfisher and White Wagtail. Well this concluded our bird watching for the day, we took man early shower because this evening we drove into Trujillo for our dinner. A pre-dinner walk around Trujillo Plaza and Castle walls produced many sightings of historic buildings and some birds. We added Serin, Greenfinch, Booted Eagle and Black Vulture to the day list. Dinner was wonderful and we even had time to walk in the finca grounds when we got back. We stayed out until dark looking and listening for Scops Owl and Red-necked Nightjar. None called or appeared so we went bed dreaming of our OWL sighting earlier.